Spiderman’s original story is one of most heavily contested and bitter disputes in the comic book world. But you have to start at the beginning, Spiderman is a fictional superhero from Marvel Comics who has been around for over fifty years, and it’s hard to imagine that his creators could have had any idea that when they gave Peter Parker his origins as a costumed wise cracking, web slinging vigilante that he would grow to be arguably their most popular hero, and would endure all this time, spawning not only a multitude of spin off comic book titles but multiple television cartoon series and more than few live action movie block busters, becoming in an effect a multi million dollar franchise. He really is one of the pin ups of the Marvel universe with amazing powers and abilities which is why he is a member of the legendary Avengers along with Ironman, Thor and Captain America. When was Spiderman created? Such a simple question yet it opens up a big can of worms. Because it seems Spiderman’s origins are a bitterly contested point among some of comic’s most iconic names, with no less than four industry legends claiming to be the creative force behind the infamous web crawler. In his autobiography Stan Lee posits that it was he who started it all when in 1962 he wanted a new title, and being influenced both by a non superhuman character called the Spider who he’d seen in a cheap pulp magazine and with a spider climbing a wall, and with these two ideas Spiderman was born. So Stan Lee called artist and writer Steve Ditko and commissioned him to do the issue, Amazing Fantasy #15 (cover dated August 1962) while Steve would be responsible for all the internal art, Stan Lee rejected his cover artwork preferring instead to have Jack Kirby do it as Lee was a big fan of his style. 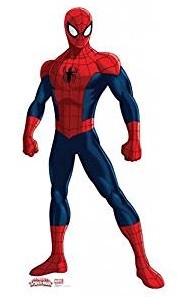 In an interview published in 1965 Steve Ditko talked about his and Stan Lee’s role in the creation of Spiderman, with Ditko saying that Stan Lee thought the name up, and that he Ditko had been responsible for the background story, costume design and all the gimmicks associated with the masked web crawler. And just to muddy the waters even further Jack Kirby claims that he and Joe Simons worked on a character together called the Silver Spider which they had developed for Black Magic publications, which he had shown to Stan Lee earlier and had drawn sample pages and that Lee had disliked them claiming they bore too much of a similarity to Archie Comic’s, The fly. Joe Simons further disputes Kirby’s version of events claiming that it was he who had thought of the name Spiderman which was overruled in favour of the Silver Spider. It is a much disputed topic with interesting bits of trivia, like the fact that both Stan Lee’s version and Jack Kirby’s and Joe Simons’ collaborated version of Spiderman both were to have a magic ring of the source of his power, but this was changed as the character The Fly also has a magic ring as the source of his power. But whatever the truth, both Stan Lee and Jack Kirby both credit Steve Ditko as reason for Spiderman’s success with his ideas and costume design appealing to readers. So with Spiderman’s first appearance in what would be Amazing Fantasy’s final issue, the sales figures were reviewed and found to be one the highest selling comics to date for what would become Marvel Comics, and so Spiderman got his own self titled publication called The Amazing Spiderman of which #1 was cover dated March 1963. The rest as they say is history. How did Peter Parker get his powers? Peter was an only child whose parents were killed in an overseas plane crash when he was just a baby. He was raised by his elderly aunt May and uncle Ben, a shy young boy it became obvious at an early age that he had an affinity for science bordering on genius. While on a school excursion to a public science exhibition Peter was bitten by a radioactive spider, which cause him to mutate giving him incredible powers, including the ability to climb walls, massively enhanced strength(proportionate to an arachnid’s) and a precognitive sense to warn him of imminent danger. At first Peter had just wanted to use his new found powers to help only himself and those he cared about, shunning the world at large, and in his first public appearance he fought a wresting match with Crusher Hogan for a cash prize. He then used this money to construct wrist mounted wrist shooters that would project an artificial webbing that he had devised himself. His reluctance to use his abilities to help other was a decision that he would terribly regret and one that would cost him the life of a cherished family member. After witnessing a burglary at the television station where he was working, he could have stopped the burglar but he chose not to become involved, meanwhile at home aunt May and uncle Ben had been arguing and uncle Ben went on a long walk and when Ben returned home he found that were being burgled and when he confronted the intruder he was shot. When Peter came home he found uncle Ben dead, donning his costume he vowed to track the killer down and exact vengeance. But to his horror when he confronted the killer he found that it was the same one that he had allowed to escape earlier. Overcome with grief and guilt Peter vowed to be more selfless remembering words that his uncle had told often, “with great power, comes great responsibility”. And so with that tragedy, Spiderman the superhero was truly born. Just how much has Spiderman been on tv and in the movies? Well Spiderman has been such a cultural icon since he first appeared in 1962 that he spawned a multitude of cartoons on television and even a live action television series and not to mention many blockbuster movies. His first show was an animated series on ABC running from 1967-1970 titled Spiderman. Then from 1978-1979 CBS produced a live action series titled The Amazing Spiderman starring Nicholas Hammond, of which the pilot movie for the series was released abroad on VHS cassette in 1980.The list of other animated series that he has appeared in is extensive including Spiderman, 1981-1982 which was syndicated, Spiderman and His Amazing Friends 1981-1983. Spiderman produced by Fox Kids from 1994-1998, Spiderman 1999-2000, Spiderman: The New Animated Series 2003 and Spectacular Spiderman 2008-2009, and finally Ultimate Spiderman 2012 – 2017 made for Disney XD. There was even a tokusatsu (which means special live action) series featuring Spider-Man in Japan. So in what was arguably the start of the current trend of huge successful comic book to movie adaptations Toby Maguire starred in three Spiderman films starting in 2002 and again in 2004 and 2007. These films were very successful and well received by fans. So much so that in 2012 and 2014 Andrew Garfield starred in two more highly successful Amazing Spiderman films. These films were all Sony films and so were not inclusive in a larger Marvel Cinematic Universe, but recently Sony brokered a deal with Disney who owned a large portion to the rights of Marvel universe characters(excluding most X-men and their villains who belong to Fox), so finally Tom Holland as Spiderman appeared alongside the Avengers in Captain America: Civil War in 2016. Spiderman is scheduled to have his own film Spiderman: Homecoming again starring Tom Holland.